Click Settings > Tax to open the tax page. 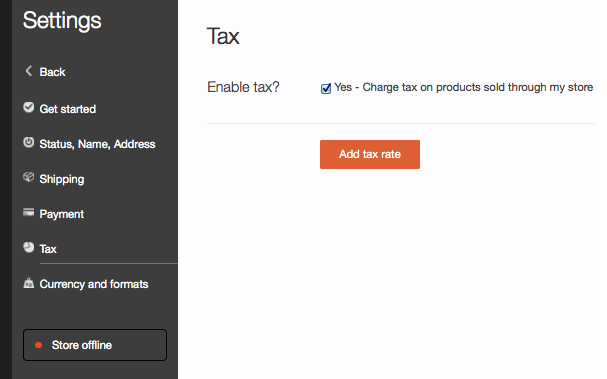 Click on Add tax rate to set a tax for your products. 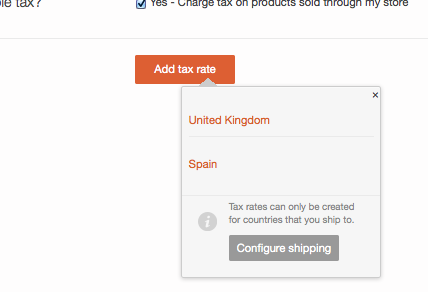 You can only add a tax rate for countries that you ship to. Select the country in this step. A single rate of tax will apply to all items in your store. If you are in Europe and the goods you sell are subject to VAT you could set the tax rate to match the VAT rate. To ensure compliance with local regulation you should always check with an appropriately certified professional.